All my life I've battled with oily hair. Every so often my mum loves to tell me about how I was born with jet black hair (which turned blonde and is now dyed dark brown) and that it was incredibly oily. Although it has improved slightly as I've grown up it hasn't got much better. I used to wash my hair every night, which was a bit of a nightmare as back then it was very long. I've now managed to get it to every other day, but even then I'll wash it one night, leave it the next day but then wash it the following morning, and if I was working 9 to 5 I don't think I could get it to last two full days. I know that dry shampoo should be my best friend, but I just don't like using them (although admittedly I've only really tried Baptiste) as for me nothing beats the feeling off clean freshly washed hair and trying to soak up any oil with a powder usually just makes me feel dirty. 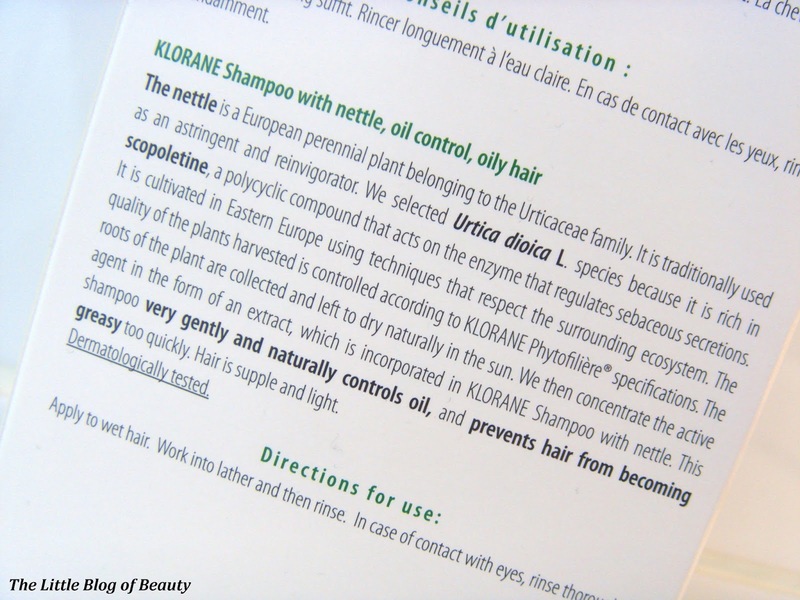 So when I spotted that Escentual were looking for bloggers to test out a French pharmacy shampoo for oily hair I nearly bit their hand off! 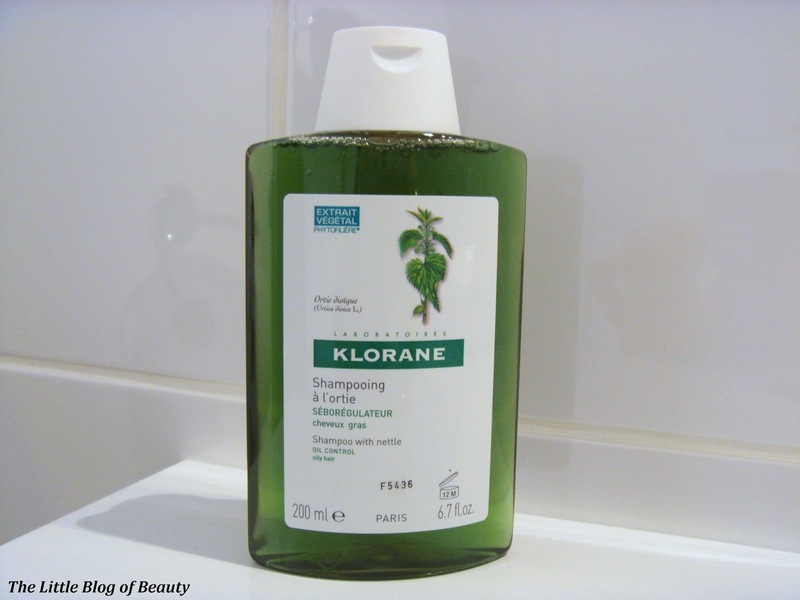 I haven't personally heard of Klorane before but they are a brand that has specialised in hair care products for more than 30 years and they use carefully selected pure plant extracts to provide gentle and natural solutions for hair and scalp problems. 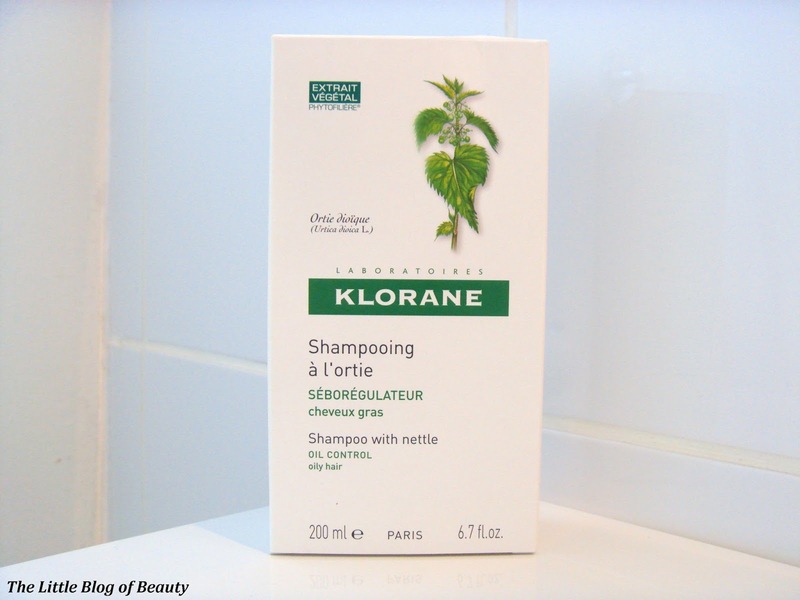 Klorane Nettle shampoo* contains Scopoletine, an extract from nettle that restores balance to the scalp. Both the outer packaging and the shampoo bottle are quite simple and kind of medical looking. When you take the shampoo bottle out of the box you're greeted by a green liquid that definitely looks like it's made from nettles. It has a slight nettle type smell to it (I'm not sure if nettles actually do smell, but if they do I'd say this is what they smell like!) that isn't particularly strong. One thing I particularly noticed is that this is super runny, as in so runny it's almost unusable. At first I did wonder if it might have melted in my house as at the time we had a problem with our heating and each night it tried to roast us alive. But after asking on Twitter several people confirmed theirs was also very runny. I did pop it in the fridge over night and it became very thick, but when I took it out later it just melted back to how it was before. So when you use this you do have to be careful that it doesn't just slip through your fingers. It's not the best latherer but you can get some lather from it. A couple of times I decided to skip using conditioner so I didn't add anything to my hair that might contribute to it getting oily quickly and I was quite surprised to find that my hair did feel quite soft despite skipping the conditioner. After sustained use oil secretion is supposed to be stabilised enabling you to wash your hair less frequently. I did only use this for a couple of weeks and I didn't notice any improvement in how quickly my hair became oily. I know I probably should have given this longer, as I'm not sure how long counts as sustained use, but I really didn't enjoy using this enough to make me want to carry on with it. This is one of the more reasonably priced French pharmacy products I've come across at just £6 for 200ml (there's also currently 25% off Klorane products on Escentual until the end of March), but even though it's reasonably priced I wouldn't buy this myself. Do you suffer with oily hair and what would you recommend? Ah pity this didn't do the trick for you, I use Batiste shampoo on my hair once it's washed and blowdried and it helps stop grease throughout the day!